My position on the morning of the 21st was in the pines on the road from Camp Walker to the gate in front of McLean's farm house, to which place my brigade had been removed on the day before from Blackburn's Ford, on Bull Run, where it had been since the action on Thursday, the 18th. The portion of the brigade with me consisted of Colonel Kemper's regiment, Seventh Virginia; Col. Harry T. Hays' regiment, Seventh Louisiana, and six companies of my own regiment, the Twenty-fourth Virginia. Upon arriving at the ford I found the companies I had before sent had crossed over Bull Run and were in position with General Longstreet's command, awaiting the signal for an assault on the enemy's batteries, which were constantly firing in every direction. 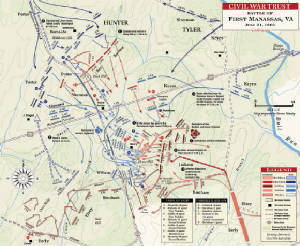 Hays' companies were drawn up in double column in rear of the ford, where they remained for some time, when I received an order from General Longstreet to march Hays' regiment back, and with that and Kemper's cross McLean's Ford and attack the enemy's batteries in the rear. Hays' regiment was immediately marched back to where Kemper's regiment was, sustaining during its march a fire of the enemy's batteries, which was directed by the cloud of dust it raised in marching, and a shell exploded in the ranks, wounding three or four men. I proceeded with Hays' and Kemper's regiments to cross at McLean's Ford for the purpose of attacking the batteries in the rear, but before the whole of the regiments had crossed, the general's aide, Colonel Chisolm, arrived with orders requiring me to resume my position. 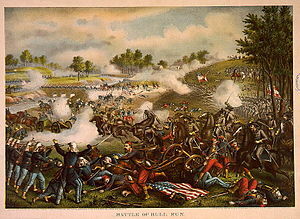 I then sent Kemper's regiment back to its place in the pines, and marched Hays' regiment up the run to Blackburn's Ford. General Longstreet then directed me to carry the regiment back to where Kemper's was, and after the men were rested a few minutes they were marched down the run by way of the intrenchments which had been occupied by General Jones' brigade at McLean's Ford. Upon arriving there I found General Jones had returned with his brigade to the intrenchments, and I was informed by him that General Beauregard had directed that I should join him (General Beauregard) with my brigade. I accepted this proposition, and immediately put the two regiments of my brigade, with Colonel Barksdale's Thirteenth Mississippi Regiment, which I found in the pines on the road leading from McLean's farm house toward Mitchell's Ford, in motion to comply with General Beauregard's directions, having previously sent Captain Gardner ahead to ascertain where the general was. I marched in rear of Mitchell's Ford in the direction of the ground on which the battle was being fought, near the stone bridge, and after proceeding some distance was met by Captain Gardner, who informed me he had been unable to find the general, but had ascertained that his headquarters were at Lewis' house, in the direction of the fighting. I continued to advance through the fields as first as my men could move, guided by the roar of the cannon and the volleys of musketry, until we reached the neighborhood of the battle-ground, when I sent Captain Gardner again ahead to ascertain, if he could, where the general desired me to go, my brigade being still kept on the march. Captain Gardner met with Col. John S. Preston, one of the general's aides, who informed him that the general had gone to the front, and that the order was that all re-enforcements should go to the front. The captain soon returned with this information, and I still continued to advance until I was met by Colonel Preston, who informed me that General Beauregard had gone to where the fighting was on the right, but that General Johnston was just in front, and his directions were that we should proceed to the left, where there was a heavy fire of musketry. I immediately inclined to the left in a direction pointed out by Colonel Preston, and soon tact with General Johnston, who directed me to proceed to the extreme left of our line and attack the enemy on their right flank. This direction I complied with, marching in rear of the woods in which General Elzey's brigade had just taken position, as I afterward ascertained, until we had cleared entirely the woods and got into some fields on the left of our line, where we found Colonel Stuart, with a body of cavalry and some pieces of artillery, belonging, as I understood, to Captain Beckham's battery. Here I turned to the front, and a body of the enemy soon appeared in front of my column on the crest of a hill deployed as skirmishers. Colonel Kemper's regiment, which was in advance, was formed in the open field in front of the enemy under a heavy shower of minie balls, and advanced towards the enemy. Colonel Barksdale's and Colonel Hays' regiments were successively formed towards the left, and also advanced, thus outflanking the enemy. At the same time that my brigade advanced the pieces of artillery above mentioned and Stuart's cavalry moved to our left, so as to command a view of a very large portion of the ground occupied by the enemy. With the advance of my brigade and the cavalry and artillery above mentioned the enemy retired rapidly behind the hill, though the advance of my brigade was delayed a short time by information from one of General Elzey's aides, who had gone to the top of the hill, that the body of men in front of us and who had fired upon my brigade, was the Thirteenth Virginia Regiment. This turned out to be an entire misapprehension; and in the mean time a considerable body of the enemy appeared to the right of my position, on an extension of the same hill, bearing what I felt confident was the Confederate flag. It was soon, however, discovered to be a regiment of the enemy's forces, and was dispersed by one or two well-directed fires from our artillery on the left. We saw the evidences of the fight all along our march, and unmistakable indications of the overwhelming character of the enemy's defeat, in the shape of abandoned guns and equipments. It was impossible for me to pursue the enemy farther, as well because I was utterly unacquainted with the crossings of the run and the roads in front, as because most of the men belonging to my brigade had been marching the greater part of the day, and were very much exhausted; but pursuit with infantry would have been unavailing, as the enemy retreated with such rapidity that they could not have been overtaken by any other than mounted troops. On the next day we found a great many articles that the enemy had abandoned in their flight, showing that no expense or trouble had been spared in equipping their army. The number of men composing my brigade as it went into the action was less than fifteen hundred, but I am unable to give exact returns, as we bivouacked eight or ten miles from our baggage, with which were all the rolls and returns, and the brigade has since been separated and reorganized. Colonel Kemper's regiment, embracing less than 400 men at the time, lost in killed 9, wounded 38; Colonel Hays' regiment lost in killed 3, wounded 20; Colonel Barksdale's regiment lost in wounded 6; making in killed 12, wounded 64; in all. 76. Without intending to be invidious, I must say that Colonels Kemper and Hays displayed great coolness and gallantry in front of their regiments while they were being formed under a galling fire from the enemy's sharpshooters, who, from their appearance, I took to be regular troops. My aide and acting assistant adjutant-general, Capt. Fleming Gardner, rendered me very efficient service during the whole day, and a Lieutenant Willis, who volunteered to act as aide, and did so, was also of great service to me. I have not seen him for several days, and did not learn the particular corps to which he belongs, but I believe he belongs to a company of Rappahannock cavalry. Colonel, Comdg. Sixth Brig., First Corps, Army of the Potomac.